Comprehensive domestic relations law representation in West Hartford, Avon, Canton, Farmington, Simsbury, and towns throughout Hartford, Litchfield, Tolland, Middlesex and New Haven Counties. West Hartford divorce attorney James T. Flaherty and his partners Sandi B. Girolamo and Pamela M. Magnano have the knowledge and experience to develop complete solutions for clients who are dealing with the breakdown of familial relationships. All of the lawyers have substantial trial and mediation experience. All three divorce attorneys serve as special masters in Connecticut courts, where they facilitate negotiations between couples. If you are looking for a divorce lawyer in Hartford, or the state of Connecticut, call Flaherty Legal Group. Flaherty Legal Group finds that the best way to draw upon the strengths of each individual member as well as the collective knowledge of the group is by utilizing a team-based approach. Most cases are assigned to two attorneys and a paralegal who work together to resolve the issues in the best, most efficient, effective manner possible. Each lawyer at the firm has been recognized by SuperLawyers® for his or her work in family law. Attorney James T. Flaherty has been selected for the Connecticut Super Lawyers honor in every year since 2009. Attorney Sandi B. Girolamo was selected for inclusion in New England Rising Stars in 2010 and to Connecticut Super Lawyers in every year since 2011. Attorney Pamela M. Magnano has been recognized in Connecticut Super Lawyers in every year since 2014, and in New England Rising Stars in 2010, 2011, 2012 and 2013. Super Lawyers is a service that rates lawyers from more than 70 practice areas who have attained a high-degree of peer recognition and professional achievement. The selection process is multi-phased and includes independent research, peer nominations and peer evaluations. Attorneys Flaherty and Magnano have also been recognized with AV ratings by Martindale-Hubbell. This “preeminent” rating is awarded to attorneys who meet a very high criteria of ethical standards and legal ability as measured by peer reviews submitted by fellow attorneys and judges. Our divorce attorneys have helped hundreds of clients in the greater Hartford area, as well as towns in Litchfield County, Tolland County, Middlesex County and New Haven County. From West Hartford and Hartford, to Glastonbury, Avon, Farmington, Canton and Simsbury… From Andover and Vernon to Cheshire and Wolcott, Flaherty Legal Group has provided successful results for clients across the state of Connecticut. The team at Flaherty Legal Group creates plans tailored to achieving the individual objectives of each client. These strategies can involve the use of alternative dispute resolution methods — including mediation, arbitration and cooperative techniques. At other times, the strategy may require the litigation experience that Attorney James Flaherty has developed over the course of 39 years litigating in Connecticut courtrooms. Attorney James Flaherty opened the West Hartford, Connecticut office dedicated to the practice of divorce and family law in 2010. Since his admission to the Connecticut bar in 1977, Connecticut Attorney Jim Flaherty has been a partner at several law firms in Hartford, CT. While Jim represents clients in courts throughout Connecticut, he and his partners at Flaherty Legal Group see the majority of their cases in the family courts of Hartford, New Britain, Litchfield, Rockville, Middletown and New Haven. 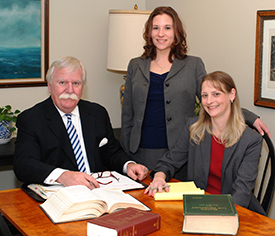 James T. Flaherty has been a lawyer in CT since throughout his entire career. With an AV rating from Martindale-Hubbell and eight consecutive selections to Connecticut Super Lawyers, Attorney James T. Flaherty often receives referrals from colleagues for cases involving complex custody issues, and large marital estates. Flaherty Legal Group is located in West Hartford and represents clients in Hartford County and throughout Connecticut in all family law matters including high net worth divorce. To schedule an appointment and discuss how our dedicated divorce attorneys can help you, call Flaherty Legal Group at (860) 904-2034 or contact the law firm online.